Spooky Hill [E1881] - $7.00 : Yarn Tree, Your wholesale source for cross stitch supplies. Cross stitch pattern from By The Bay Needleart. 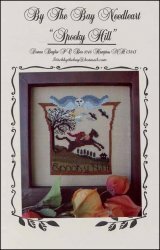 The verse "Spooky Hill" is stitched underneath a scene of the Headless Horseman accented by a tree, bats, and other Halloween motifs. Stitch count 77 x 77.